Hope to see you at this event! 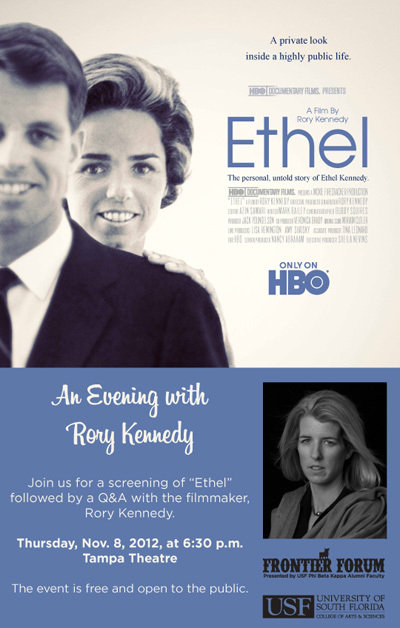 TAMPA, Fla. -- Emmy award winning filmmaker Rory Kennedy will be at the Tampa Theatre at 6:30 p.m. on Nov. 8 for a screening of her latest work, "Ethel." We asked Kennedy five questions about the making of "Ethel." Question: Why was it important for you to make this movie on your mother? Rory Kennedy: My mother is an extraordinary woman. I was excited about sharing her personal history with a broader audience. And I did it in part to document her life for our family. But she has lived a remarkable life -- a life that is intertwined with our collective national history. She has been on the front lines of many major events in American history. So her story and that of my family, is, in many ways, an American story. I certainly learned a lot in making this film -- and I hope it has something to offer. Q: Why did you choose to make this film now? K: Sheila Nevins at HBO approached me about doing a documentary about my mother, and I was resistant at first because it’s my mother; it’s personal. But I also felt that my mother has this amazing story and it would be a great opportunity to share this remarkable person with the rest of the world. My mother hadn’t given an interview in decades -- she really dislikes them. So I thought she would never do it. I figured I would just ask my mother and she would say no and I would tell HBO my mother said no. Then I asked my mother and she said yes! Q: You already have had a very long and prestigious career with 30-plus films of varying topics, so how important was it for you to come to this personal subject at this point of your career? K: A large part of my interest in being a documentary filmmaker is in documenting the world outside my own experience, whether that is poverty in Appalachia, torture at Abu Ghraib, or the impact of the AIDS pandemic around the globe. I have never been very interested in using the form to directly explore my own life. Additionally, I don’t think I could have made this film 20 years ago when I was starting my career, or for that matter even 10 years ago. I think I needed to have a greater confidence in my work, in my ability to shape this story and take it out into the world the way it deserves. There’s a certain level of experience and confidence that I have at this point in my career. Q: The film is driven by an interview with your mother. Why did you choose to interview your siblings as well? Were your siblings on board from the beginning? K: I had initially conceived of the project as a single interview with my mother -- an “in her own words” type of film. Then as I became more familiar with the archival material, I noticed that my siblings were always there -- from the Hoffa Hearings, to the various campaigns; from John F. Kennedy’s Inauguration as President to the integration of the University of Alabama. The children played an integral role in all aspects of my parents’ lives, and I felt their perspective was important. Also, there have been a number of films done about my family over the years that included friends and associates who worked with my father, or perhaps writers or journalists who covered my family. I wanted “ETHEL” to be a more intimate portrait, a film not just about my family but from my family -- a deeply personal perspective about the events that shaped both us and our country. Q: Did your mother or siblings reveal anything to you during the making of this film that you were unaware of? Was there anything new you learned? K: Making this film about my mother and having the chance to sit down with her and my siblings has been a rare privilege. How many of us have had the chance to sit down with our parents or siblings and ask them everything we’ve ever wanted to know? And though it was hard to do at points, I will always be grateful for that experience. So what did I learn that was new? Well, I didn’t know that my mother used to bet on horses when she was at college. Or that my father and siblings slid down the banister of the White House the day Jack and Jackie moved in. I didn’t know that our pet seal Sammy ate fish but spit out the eyes…So there were a few new facts I picked up along the way, but the greatest gift was gaining a deeper understanding of my mother. She is an incredible woman. I knew it going in, but have an even greater appreciation for her now. Got a question for Rory Kennedy? Submit your question today and she just might answer it at Thursday night's event!